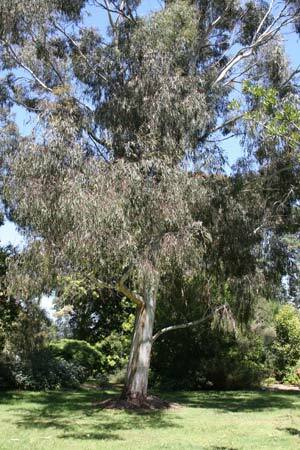 Eucalyptus scoparia or Wallangarra White Gum could be used as a feature tree in a large garden, or as a street tree in open situations or as a shade tree in rural locations. Interesting because of its growth habit Eucalyptus scoparia is a reasonably fast growing tree however at maturity will reach only 12m or so. This makes it a very useful tree mid sized tree for urban landscaping situations. With a broad open crown it is a tree that provides good dappled shade. Excellent in larger gardens. parks or as a street tree. With slightly pendulous habit and small white flowers in early summer Eucalyptus scoparia or Wallangarra White Gum is another useful Australian Native Tree. The smooth white trunk is an attractive feature with its shedding bark. The foliage id a mid green and glossy and small white flowers appear in summer. The flowers are followed by small gum nuts..
An open growth habit and a naturally slightly weeping or pendulous habit make this an attractive specimen tree. It is suited for use as a street tree, a shade tree in larger gardens or parks as well as a windbreak tree in rural situations. Use it as an informal screening tree around commercial developments where it evergreen nature and white trunk provide visual interest year round. Spread – Will form a crown of around 8 metres across. Growth rate – The growth rate is fast when young and then regarded as medium. Attractions – Smooth white bark, broad spreading crown, drought and frost tolerant once established. Foliage – Narrow and long, lanceolate in shape and a mid green.